Highest stage count that are used one right after the other? Here I'm asking for the highest stage count used one right after the other. Unlike the stack that got to the Moon, each stage should ignite quickly after the previous stage. This then excludes things like the Saturn V and other stacks with booster stages that are ignited hours or days later. Historical rockets and suborbital sounding rockets are fine, as long as it makes it to space (crosses the line whose name shall not be spoken). Seems that as technology progressed the number of stages has been reduced from the common 3-4 stages down to 2 for nearly all modern launch systems. Would love to see if anyone finds an instance where more stages were used! 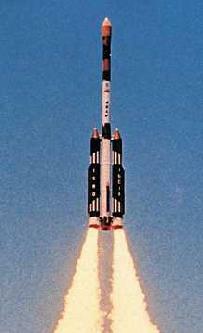 As discussed in one of the linked questions, Minotaur V is another 5-stage orbital launcher. Jason is a 5-stage sounding rocket. Not the answer you're looking for? Browse other questions tagged rockets stages or ask your own question. Highest stage counts in actual launchers? What is the most widely used first-stage rocket engine in operation today? Why did the Saturn V stage fairing appear to burn after separation? What are the “nacelle” like protrusions on the first stage of Black Arrow? What fuel is used in the second stage of orbital launch vehicles? What is used to connect the side boosters to the first stage? What are the advantages of separating a stage few seconds after its burn out? What is the most energy efficient & inexpensive propulsion system other than chemical fuel oxidizer that could be used in rockets?